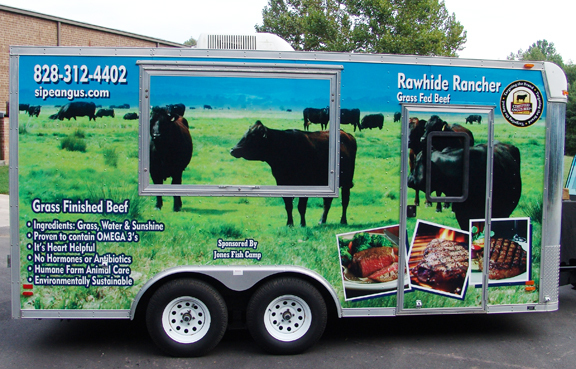 Rawhide Rancher provides a public way for Sipe Angus to share our beef with our local community. It’s a mobile food stand that we bring to festivals and special events. All of the beef served in the stand is USDA approved grassfed black Angus beef. We serve old-fashioned hamburgers, cheeseburgers and cubed steak sandwiches. We are a healthy and delicious option for festival food. 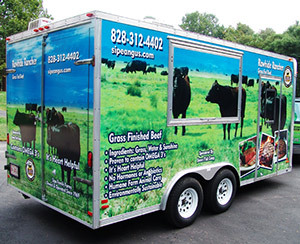 Look for the trailer with the cows on it for you next festival meal. Sipe Angus beef is also available in lbs., steak cuts and more. See our price list.